In an amazing display of bureaucratic hubris, the Centers for Medicare & Medicaid Services (CMS) has proposed a mandatory, real-world experiment with provider reimbursement under the Medicare Part B program. Click here to read the summary. You can read the details in this Federal Register notice. As I explain in more detail below, CMS wants to reduce reimbursement for buy-and-bill drugs—but for only half of the country's providers. The other half will retain current reimbursement levels. After five years, CMS will see what happened. Some potentially good ideas are buried in this mess. But the proposal so overreaches that it will face enormous opposition and has little chance of being implemented. Even if CMS can get the first part of its proposal off the ground, I doubt that CMS will be able to draw any meaningful conclusions from it. Marketplace realities will undermine the integrity of this massive and unprecedented experiment on patients and providers. 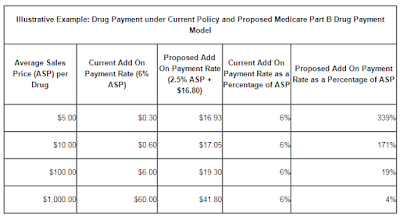 Read on for my summary of CMS’s proposed Part B Drug Payment Model and the glaring methodological flaw that could end up raising drug costs. There will be no gold at the end of this rainbow. Before examining CMS’s proposal, let’s briefly review buy-and-bill under the Medicare Part B program. The following material has been adapted from Chapter 3 of our magically delicious 2015-16 Economic Report on Pharmaceutical Wholesalers and Specialty Distributors. For physician offices and outpatient clinics, the provider purchases and administers the product before submitting a claim to Medicare. After purchasing a drug from a wholesaler or specialty distributor, the provider will store the product at its location. The provider then administers the drug to a patient. After the patient receives the drug and any other medical care, the provider submits a claim for reimbursement. The process is called buy-and-bill, because the medical claim is submitted after the provider has purchased and administered the drug. Medicare is the largest payer of provider-administered drugs. Its Part B program covers provider-administered injectables and certain other drugs. 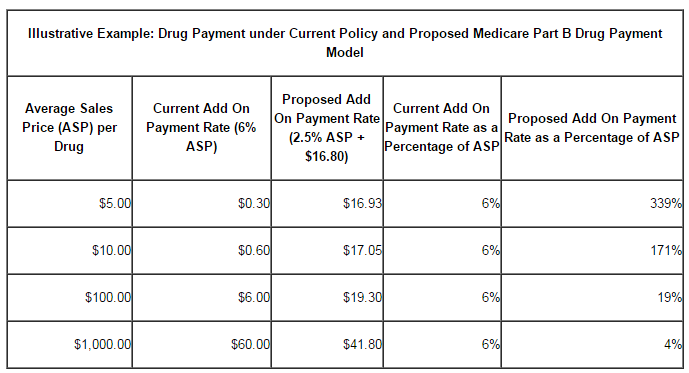 The Medicare Prescription Drug, Improvement, and Modernization Act of 2003 (MMA) mandates that Medicare use a drug’s Average Sales Price (ASP) for reimbursing provider-administered injectable drugs. ASP is based on the manufacturer’s actual selling price, i.e., a drug’s list price minus all price concessions. 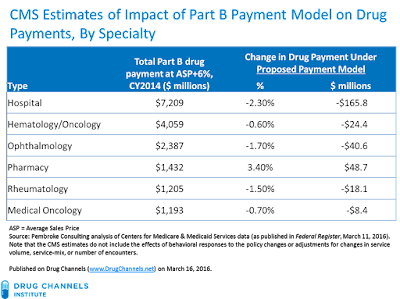 Commercial payers now use ASP as a key reimbursement method for physician offices (but not hospital outpatient sites), as shown in this chart from our Drug Channels post How Hospitals Inflate Specialty Drug Prices: The Latest Medical Benefit Reimbursement Data. CMS IS ALWAYS AFTER ME LUCKY CHARMS! CMS wants to go after the buy-and-bill system’s theoretically perverse incentive for physicians to prescribe more-expensive drugs. 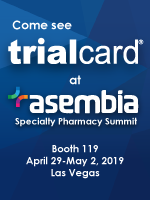 For pricey specialty drugs, even a low single-digit markup over ASP can generate substantial dollar profits for a provider. In other words, half of the providers will continue to receive ASP+6%. The other half will receive the lower ASP+2.5% rate plus a fixed $16.80 payment. To illustrate the impact, CMS provides the following numerical example of markups (not profits) under the current system and under the proposed Part B payment approach. 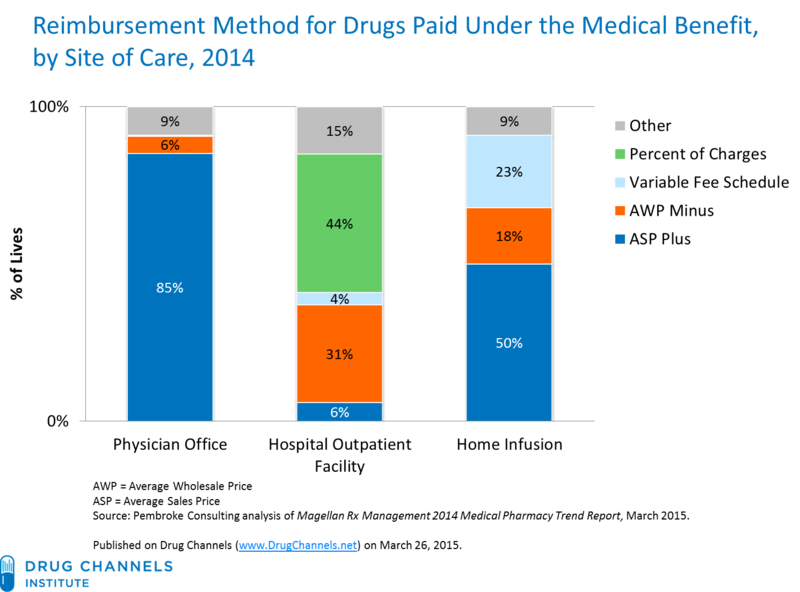 In CMS’s example, a $1,000 drug generates 20 times as much markup as a $5.00 drug. In the proposed model, the more expensive drug generates only 2.5 times as much mark-up as the lower-priced drug. A provider that administers a lower-priced drug will benefit, but one administering a higher-cost drug will lose. Here is my summary of CMS’s projected financial impact on hospitals and five medical specialties. 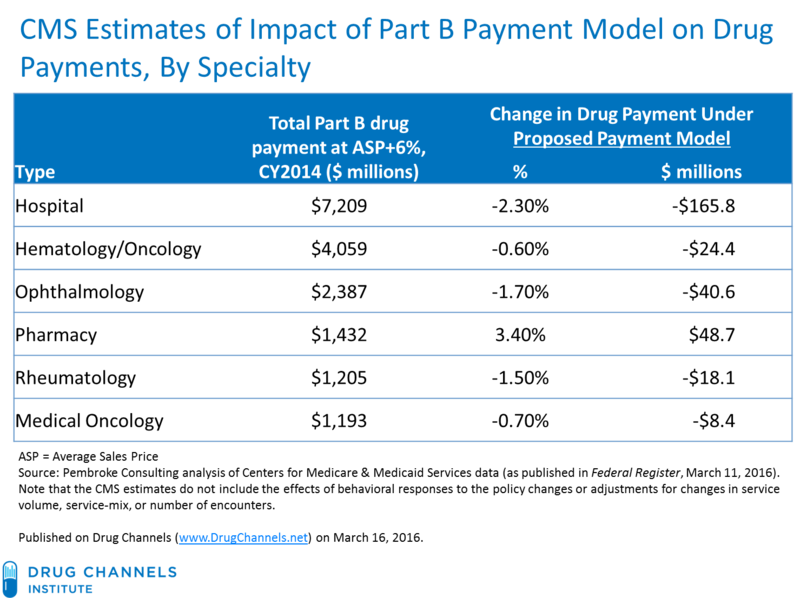 In calendar year 2014, these six groups accounted for 86% of total Part B drug payments. Note that the financial impact estimates exclude any behavioral offsets—an important issue that I consider below. Oddly, CMS seems to have ignored what it recently mandated for retail pharmacies: acquisition cost reimbursement plus a professional dispensing fee. See Seven Pharmacy and Channel Implications of the New AMP Final Rule. Obviously, this is not a double-blind trial. Providers and perhaps patients will know their “treatment” arm. And therein lies the problem. CMS has not accounted for behavioral and treatment changes that could occur during its model evaluation period. Consequently, CMS will be unable to draw any meaningful conclusions about its proposed model. Here's why. CMS proposes assigning providers using Primary Care Service Areas (PCSAs), which are defined by aggregating ZIP areas to reflect Medicare patient travel to primary care providers. According to CMS, there are 7,144 PCSAs in the 50 states and 7,048 in the model. These practices are for-profit private businesses. They will surely attempt to optimize against the CMS Phase I proposal by, for example, strategically directing patients to certain locations based on the cost of therapy and expected reimbursement. CMS briefly acknowledges reality, stating: “It is possible, however, that large practices may have practice locations in more than one PCSA. As a result, there could be situations during the model test in which those large practices are exposed to multiple arms, and thus to different payment methods simultaneously” (page 13238). I disagree. 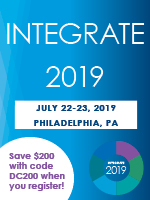 Instead, multi-location practices will be frequently and consistently exposed to multiple study arms, especially in the southeastern and southwestern United States. These marketplace realities will undermine the integrity of the Phase I results and CMS’s ability to draw accurate conclusions from its unprecedented experiment. Consequently, cancer patients will undergo a giant experiment that will likely be a waste of time. CMS even claims that its Phase I proposed model is “budget neutral.” This conclusion is based on the false assumption that there will be no behavior change in response to the study. (See CMS’s comments that it did “not attempt to predict behavioral responses to our policy changes” on page 13254 of its proposal.) I suspect that total payments could ultimately be higher due to market reactions to the proposal. CMS also ignores the possibility that patients will be shifted to higher-cost sites of care, including hospital outpatient departments. The Office of Inspector General (OIG) has documented how 340B-eligible hospital outpatient departments earn tremendous profits from the Medicare Part B program. Gross profit margins are about 60% compared with 3% to 4% for a non-340B outpatient program. See New OIG Report Shows Hospitals’ Huge 340B Profits from Medicare-Paid Cancer Drugs. Since CMS is unable (or unwilling) to attack hospitals’ excess 340B profits, it instead wants to monkey around with the 3% to 4% margin for non-340B outpatient programs. 340B hospitals' higher profits also mean that the financial sting from CMS's experiment will be mild—and may further shift business away from community practices. A few years ago, CMS tried to blow up the Medicare Part D program. A broad and diverse coalition successfully got CMS to run away from reconsider its overhaul. Refresh your memory with Run Away: CMS Abandons Part D Preferred Pharmacy Network Changes. “Yesterday’s announcement marks another troubling example of unelected bureaucrats making decisions behind closed doors that impact the American people and their healthcare. This decision was made with a complete lack of transparency and clear disregard for the people and stakeholders who will be impacted the most. In addition, more than 100 patient groups, industry associations, and companies also sent CMS a stern letter of opposition. Click here to read it. A final word of caution: Before you celebrate our oh-so-wise government’s focus on “value,” I hope the plan’s cheerleaders think through the real-world implications of this poorly thought-through experiment. There's much more at stake than clovers and blue moons.